Footwear export turnover aims to reach US$22 billion with a growth rate of 11 percent this year, according to Mr. Diep Thanh Kiet, vice chairman of the Vietnam Leather, Footwear and Handbag Association. At a meeting to discuss on solutions to improve the country’s footwear export, Mr. Kiet said that Vietnamese footwear industry has many advantages to develop. Particularly, labor costs in Vietnam are low. It is estimated that if wage rate increases by 5 percent this year, Vietnam’s cost of labor is still more competitive than that of other countries in the region. As for market, Vietnam’s footwear still managed to maintain competitiveness on traditional export markets. For instance, the US market removed preferential policies for footwear imported from China and India, this has created favorable competitive opportunities for Vietnamese footwear. In addition, the effective Comprehensive and Progressive Agreement for Trans-Pacific Partnership has helped the country’s footwear industry to expand market to America. Meanwhile, export turnover remains stable in the European market. 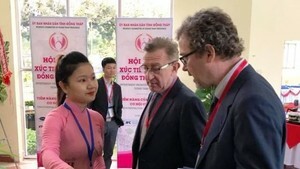 If the EU-Vietnam Free Trade Agreement is passed this year, it will spur the industry’s growth rate to above 15 percent, sending export turnover to more than $22 billion. On the contrary, the footwear industry also suffers negative impacts. Particularly, firms still have to depend on imported raw materials. Therefore, changes in the prices of raw materials will likely to greatly affect the growth of footwear industry. Moreover, most firms in the footwear industry are small and medium enterprises so they have not joined the global supply chain but have been mainly working as processing firms. 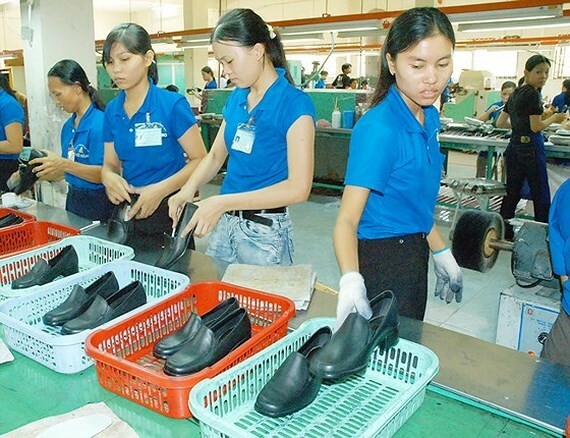 Application of technology in management and production of Vietnam’s footwear industry remains poor. Labor productivity is only equal to 60-70 percent of that of foreign direct investment companies. Footwear firms also have to face the risk of being imposed safeguards while trade protectionism from other countries has been increasing. Therefore, in order to improve internal strength, Vietnamese footwear makers have to upgrade technology so as to handle large orders, hereby establishing the foundation for them to participate in the global supply chain. At the same time, they should focus on investing in research and development centers, gradually increasing added-value for export footwear products.